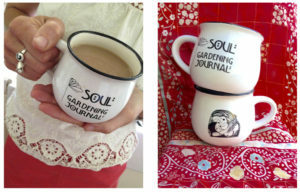 Introducing the first step of the Soul Gardening Swag line-up: black and white breakfast, lunch or dinner mugs, with logo and original SGJ artwork. 9 oz. glazed ceramic. Use for hot or cold coffee, tea, beer, soup, flowers… dishwasher and microwave safe. Prices include shipping! 100% of proceeds of these items go toward the printing and shipping of this journal! 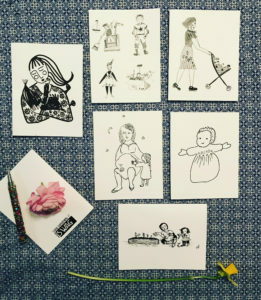 Notecard Bundles: All artwork original journal sketches by Mary and Sia of the SGJ Crew. Price includes shipping. All proceeds go towards the printing and shipping of Soul Gardening Journal. 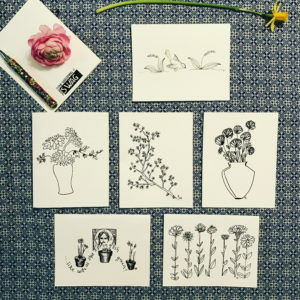 Floral: An assortment of six standard 4.25 x 5.5″ folded cards with white envelopes. Blank inside. Swag Shop Logo on back. Mother’s Work: An assortment of six standard 4.25 x 5.5″ folded cards with white envelopes. Blank inside. Swag Shop Logo on back.